In a follow-up interview related to his new gold report, commodity analyst Ronald Stoeferle discusses with financial journalist Lars Schall for MATTERHORN ASSET MGMT some more crucial points for a better understanding of the action in the gold pits. This time around they talk about, inter alia: “Resource Nationalization”; Peak Gold; the “Asian love affair with gold; and the “aurophobia” of certain old men in finance. The report written by Ronald Stoeferle is available HERE. Ronald Stoeferle, who is a Chartered Market Technician (CMT) and a Certified Financial Technician (CFTe), was born October 27, 1980 in Vienna, Austria. During his studies in business administration and finance at the Vienna University of Economics and the University of Illinois at Urbana-Champaign in the USA, he worked for Raiffeisen Zentralbank (RZB) in the field of Fixed Income / Credit Investments. 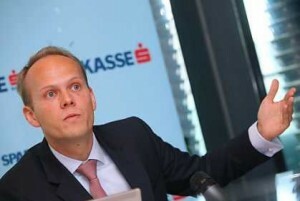 After graduating, Stoeferle joined Vienna based Erste Group Bank (http://www.erstegroup.com), covering International Equities, especially Asia. In 2006 he began writing reports on gold. His five benchmark reports on gold such as “A Shiny Outlook” and “In Gold We Trust” drew international coverage on CNBC, Bloomberg, the Wall Street Journal and the Financial Times. Since 2009 he also writes reports on crude oil. Lars Schall: A lot of goldbugs are accused that they cheer about high gold prices while the whole world is in a mess. How do you feel about this, Mr. Stoeferle? Ronald Stoeferle: To be honest, I would love to be bearish on gold. For this would mean that we’d have sound money, low debt levels, a solid financial system. I do not wish for prices at 10,000 per ounce. This would imply major (social) disruptions and the end of the world as we know it. I really love this quote by Ayn Rand: “You can avoid reality. But you cannot avoid the consequences of avoiding reality.” Therefore, we have to be realistic and admit that the (tail) risks we’re facing are getting bigger and bigger from day to day. L.S. : What has to be said about the US debt in relation to gold? R.S. : I think that excessive structural debt suggests further increase of the gold price. A wrong diagnosis of causes leads to wrong solutions. The systemic problem is not low tax revenue, but excessive spending. Additional tax hikes will never consolidate the public budgets in the long run. This can only be achieved by structural reforms in the spending department. According to Schlesinger saving is tantamount to holding back on consumption in the present in order to be able to consume more in the future. The opposite is true for credit, where today’s benefit is bought with tomorrow’s shortcoming. • In fiscal 2011 public spending in the US amounted to USD 3,700bn, whereas revenues were falling short, at USD 2,400bn. Tax revenues covered only 65% of expenditure. Reinhart and Rogoff call this the “bang point”, at which the confidence of creditors often tends to collapse. • Within the past twenty years debt has increased by 350%, while the interest burden has only risen by 60%. If interest rates were on a similar level as in 1991, interest paid would have increased to USD 1,200bn. According to the CBO, government debt will rise to USD 20,000bn by 2015. At an interest rate of 5%, interest payments would then amount to USD 1,000bn, or 45% of current tax revenues. • Today, the USA has three times as many Treasury bonds outstanding as ten years ago. In the meantime, the average interest rate has fallen from 6.1% to 2%. Is that a logical development? Hardly, seeing as last year 61% of all bond issues were bought by the Federal Reserve. In 2008, it had been an insignificant percentage. This results, on the one hand, in an erroneous impression of high demand, and on the other hand, it downplays the urgency of slashing debt and getting structural reforms underway. • The budget of the current fiscal year will produce a deficit of USD 1,300bn – an amount that would have exceeded the entire budget in 1990. During Barack Obama’s term in office, public debt has increased by more than USD 5,000bn – the same amount of debt that had been amassed over a period of 211 years from George Washington’s inauguration in 1789 to Bill Clinton’s second term. The average deficit between 2000 and 2007 amounted to USD 174bn, while the annual shortfall has come to an average of USD 1,160bn since 2008. Although we are currently faced with the highest level of public debt in times of peace, a far-reaching consolidation of public budgets does not seem to be up for discussion. The required grave cutbacks are being postponed, and the policy of “muddling through” is cheerfully continued. The longer structural and far-reaching reforms are postponed, the more substantial will be the need for adjustment and thus greater the burden on future generations. According to the Austrian School of Economics every act of consumption has to be preceded by production first. “Debt is nothing but consumption brought forward which will then not take place in the future.” There does not seem to be a painless therapy for these problems. I believe that gold is an effective medicine. Thus I expect interest rates to be kept low for an extensive period of time, and this in turn is one of the strongest arguments in favour of a rising gold price. L.S. : Why is it of interest that the BRICS members discuss seriously the establishment for an own bank? R.S. : I have already discussed this very interesting topic in my previous reports. From my point of view, the voices critical of the US dollar hegemony are becoming increasingly louder. It seems that many countries want to cast off the shackles of the US dollar. China, Russia, India, as well as Japan intend to increase the share of trade invoiced in their own currencies so as to circumvent the US dollar. This clearly marks a paradigm shift, not least because more than two thirds of all US dollars are held abroad. The BRICS countries have now stepped up mutual cooperation. The five countries currently account for almost 28% of global economic output, with a sharply rising tendency. The newly created BRICS Bank is supposed to finance development projects in emerging countries in the future. In addition, the idea is to facilitate bilateral trade and credit in the local currency as well as to circumvent the US dollar. L.S. : What are the driving forces for the “Asian love affair with gold“? There is a wonderful quote by James Steel: “Gold goes where the money is; it came to the United States between World Wars I and II, and it was transferred to Europe in the post-war period. It then went to Japan and to the Middle East in the 1970s and 1980s and currently it is going to China and also to India.” That’s basically it: Gold has always abandoned regions of stagnating wealth, heading instead for prospering economies and rising savings volumes. In 1980 Europe and the US accounted for 70% of gold demand, since then this share has plummeted to below 20%. Within the past five years the share of the emerging markets in terms of total gold demand increased to 70%, with China and India accounting for more than half of that. Years of financial repression, an unstable monetary system, and the resulting loss in purchasing power, combined with cultural and religious aspects, seem to have been the decisive factors. I think that Gold is often called the investment of doomsayers and chronic pessimists. This component is currently presented as the only reason for the gold bull market. However, this point of view fails to acknowledge the fact that China and India are the driving factors on the demand side. Real interest rates remain negative in both countries. On top of this the market is clearly underdeveloped with respect to its investment universe. Basically local investors are very limited when it comes to the use of their savings. Gold has been a time-tested store of value for centuries. The traditionally high affinity for gold and the rising net worth will support demand in the long run. Whoever expects incomes in China and India to continue rising and real interest rates to remain negative or low, will by default recognize gold as the beneficiary of these developments. L.S. : The Vietnamese have rather a nightmare of gold, correct? Yes, that’s true. Gold affinity in Vietnam is extremely high. Gold is accepted as an every-day means of payment. For example, house prices are given in dong and in gold. Although the German GDP is almost 40 times higher than the Vietnamese one, gold demand per capita in Vietnam almost matches that of Germany. Given that inflation in Vietnam was significantly above 15% last year, foreign exchange reserves were falling rapidly, the trade deficit has been growing relentlessly and the Vietnamese dong has already been depreciated six times since 2008, it comes as no surprise that the Vietnamese people hardly trust in their currency anymore and have started accumulating gold. The Vietnamese government has now reacted to this scepticism vis-à-vis the purchasing power of the dong. Plans are to “restrict and centralize” the gold market. According to a decree, the Vietnamese are still allowed to buy and sell gold, but a ban has been imposed on its use as a means of payment. • The number of gold traders will be substantially reduced and will be put under tighter scrutiny. Licensed gold traders now have to register on the basis of a minimum nominal capital of VND 100bn (i.e. close to USD 4.7mn), they have to have been in the gold trading business for at least two years, and they have to have paid taxes of at least VND 500bn. • The central bank will control gold imports, the production, and the buying and selling of gold jewellery. • Gold terminal trading and international accounts are supposed to be centrally monitored. When in doubt, the central bank may intervene. • The gold market will be “regulated” by taxes. • A campaign is to be launched that will try to persuade the Vietnamese population to transfer their privately stored gold into the custody of banks. Due to the recent measures, gold prices have increased substantially, the black market is thriving, and counterfeit and inferior goods have entered the market. This is the logical consequence of such interventions. L.S. : Would you like to address the problem of “resource nationalism“ a bit, please? R.S. : Yes! I believe that growing resource nationalism puts additional pressure on companies: the trend towards nationalization and higher taxation of the mining industry has again picked up from last year. The chronic budget deficits around the globe trigger a certain degree of greed. A vast array of new taxes and licence fees have recently been introduced or proposed. This means that for the investor the selection of the right jurisdiction has become one of the most important criteria for gold share investments. L.S. : Can you explain to us some of the various price targets you see for gold? R.S. : You know that I am an “Austrian from Austria”, and as I have tried to explain to you already in our first interview, there is no objectively measurable value of a good. According to Carl Manger’s theory of subjective value, the value of a good is derived from the marginal utility with regard to the set goal. This means that the value of a good or a service is therefore of no objective value, but the result of a subjective process of valuation. Furthermore, according to Roland Baader, every value is a phenomenon of subjective valuation and can only be ranked in the scale of preferences of an individual. Since there are as many different scales of preference as there are people (and since the ranking of preferences keeps changing all the time as well), the value of a good or a service can never be objectively measured. However, I believe that bull markets basically tend to look alike, given that human behaviour and emotions are similar in extreme situations. On this basis, we can compare the psychological pattern of the various trend phases. Greed, fear, and panic determine the beginning and the end of bull markets. Therefore, I expect that gold and gold shares could develop along similar lines as the Nasdaq at the end of the 1990s. L.S. : Can you give us then some examples for your ratio-analysis? R.S. : Sure. The ratio of gold and the money supply aggregates M0 and M1 underpin the significant upward potential that gold has. In order to reach the high of the ratio of gold to M0, gold would have to increase to USD 12,000 (at constant money supply). To reach the high of the same ratio for M1, the gold price would have to rise to USD 3,800. The broadest concept of money supply, M3, indicates a low gold price as well. While M3 totalled USD 1,800bn in 1980, according to Shadow Stats it has meanwhile increased to almost USD 15,000bn. Currently the ratio is at 0.11x and thus only slightly above the long-term median of 0.088x. In order to reach the 1980 ratio, the gold price would have to soar to USD 8,300 (at constant M3). L.S. : What has to be said with regards to the topic of Peak Gold? R.S. : In his very interesting dissertation, Jürgen Müller applies the insights of Hubbert’s oil model to gold production. (1) He shows that the production curve of mines is almost bell-shaped. As a result, not only has the gold content of the ore fallen for decades, but the colliery waste has increased massively as well. The impurities of the ore intensify, and the distribution of gold within the ore becomes more and more fine-grained, which results in an increased energy input for gold production. The study claims that in the future gold will be increasingly derived from secondary sources, such as production from porphyric copper/gold deposits. Falling primary production, for example in South Africa, can still be compensated for by rising secondary production. According to Müller, this trend could continue up to an annual production of 3,000 tonnes. This maximum (peak gold) should be reached between 2027 and 2044. Prior to that, the increase in annual production will be a moderate one. In three different scenarios, Müller estimates total production of 245,000 to 440,000 tonnes of gold. According to Müller, the relationship between gold content and required energy input per unit produced is not linear, but exponential. This means that if the gold content in the rock decreases, more rock has to be broken, mined, transported and processed in order to produce the same amount of gold. As a result, the ecological challenges have increased drastically as well. Due to the higher share of surface mining, the ratio of colliery waste to ore has soared since the 1980s from below 1x to above 10x, which has caused costs to increase exponentially. In 2007, the gold content of newly discovered ore lodes was down to 1.1 gram/ton and has been continuously falling. The ratio of return on investment has decreased from 105x in the 1960s to 11x in the first decade of the new millennium. This means that, since the turn of the millennium, for every dollar spent on exploration, only 11 dollars worth of gold are discovered anymore. In other words, the ratio has fallen by a factor of 10 since the 1960s. L.S. : What’s “Warren Buffet’s Aurophobia“? R.S. : First of all I have to admit, that my friend Ben Davies coined this wonderful term. I think we are seeing this “aurophobia“ everywhere I’m presenting, especially in the financial sector. This pathological fear of, or aggression towards, gold does not seem to exist for any other currency or other asset class. After all, I have not heard of such a profound aversion against copper, I do not know of any “bond haters”, nor are militant property bashers a popular concept. L.S. : I haven’t heard about them either (laughs). R.S. : For reasons I really do not understand, Warren Buffet has more and more frequently declared the low esteem in which he holds gold. He criticizes the low industrial use, the lack of intrinsic value, and questions the general reasonableness of buying gold. I believe that Buffett has made a fundamental error, having missed the connection between gold and money and is thus comparing apples and oranges. The majority of demand is based on monetary requirements. Therefore, in this case he should not compare gold with equities, but with cash. Gold is an alternative currency and not an investment. Taking this train of thought further, the same arguments then applies also to the US dollar – it has no intrinsic value, no industrial use, and does not pay any interest at this point in time either. Warren Buffett’s aversion to gold may also be explained by a certain rebellious behaviour against his father, Howard Buffett. Buffett sr. was a liberal senator (in the sense of classical liberal) who spent every living day campaigning for a return to the gold standard. As we all know Charlie Munger also showed his critical attitude on CNBC, saying that “gold is a great thing to sow into your clothes if it is 1939, you are in Vienna and you are Jewish, but civilized people do not buy gold – they invest in productive companies”. L.S. : Warren Buffet hold once a significant silver position. Are you optimistic for silver? R.S. : Looking back over the centuries, we find that gold has recorded a substantial increase in purchasing power vis-à-vis silver since the beginning of the 20th century. The long-term median (since 1688) is 15.8x. This also reflects the actual ratio of geological deposits: gold is about 17 times more scarce than silver. According to USGS, the measured and assumed silver resources are actually only about 6 times as high as those of gold. In ancient Egypt, gold was worth 13.3 times as much as silver. This ratio was based on astronomical calculations (seeing as the silver moon was moving 13.3 times faster through the zodiac than the golden sun), and this lasted for more than 800 years until the times of the Lydians. In times of bimetallism, the ratio would usually be situated between 10x and 15x. Of course, that ratio had not been established by the market, but by the various governments. The ratio has been on the increase since 1870, which could also mean that the free market regards gold as the primary monetary metal. L.S. : Your take on the performance of gold so far in 2012? R.S. : Gold is up 1% in USD terms and 8% in EUR. Not that bad. We are seeing a normal consolidation pattern at the moment. Sentiment is at the most bearish extreme levels since 2008 and this will provide a very healthy base for new all time-highs – especially as seasonality is getting better from August onwards. Jürgen Müller: “Modellierung der globalen Goldproduktion durch Anwendung der Hubbert’schen Peak-Oil Methodik”, BoD-Verlag Norderstedt, 2012.